By the dawn of the 1980s, Uriah Heep was considered a relic in the heavy metal world and no one was surprised when they disbanded shortly after 1980s half-hearted Conquest album. However, everyone listening received an unexpected surprise when the band returned with a new lineup and a sleek, revamped sound on 1982's Abominog. If one can get past the Spinal Tap-like title and the gruesome cover art, this outing quickly reveals itself to be one of the most consistent and engaging albums in the group's lengthy catalog. 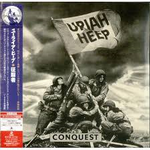 Uriah Heep's first new album in almost two years, and their first, too, since the departure of vocalist John Lawton, was all but overlooked at the time of its release, although it should also be noted that this is the freshest-sounding Heep album since the mid-'70s. No longer attempting to trade off former glories, the band is hard and sharp throughout, with the eight tracks averaging out around the five-minute mark, and all being designed according to what they could bring to the live show -- which, at this time, was seething. After rising from the ashes with 1982's impressive Abominog, Uriah Heep continued to pursue a similar combination of heavy metal firepower and AOR sleekness on Head First. This album lacks the consistently strong tunes and unified feel of its predecessor, but it still offers enough highlights to make it worth a listen. Spot-on in its selection and sound quality, this is desert-island Uriah Heep! This 2CD set is pure gold, drawing liberally from their best albums (SALISBURY, LOOK AT YOURSELF, DEMONS AND WIZARDS, and THE MAGICIAN's BIRTHDAY), while distilling the highlights from some of their less-inspired efforts. If, in listening to these discs, you think you've forgotten how good Heep was, you haven't. 2-CD Set in Slipcases with fold-out poster, which has been signed by Ken Hensley!